An ice core is a core sample that is typically removed from an ice sheet, most commonly from the polar ice caps of Antarctica, Greenland or from high mountain glaciers elsewhere. As the ice forms from the incremental buildup of annual layers of snow, lower layers are older than upper, and an ice core contains ice formed over a range of years. The properties of the ice and the recrystallized inclusions within the ice can then be used to reconstruct a climatic record over the age range of the core, normally through isotopic analysis. This enables the reconstruction of local temperature records and the history of atmospheric composition. Ice cores contain an abundance of information about climate. Inclusions in the snow of each year remain in the ice, such as wind-blown dust, ash, pollen, bubbles of atmospheric gas and radioactive substances. The variety of climatic proxies is greater than in any other natural recorder of climate, such as tree rings or sediment layers. These include (proxies for) temperature, ocean volume, precipitation, chemistry and gas composition of the lower atmosphere, volcanic eruptions, solar variability, sea-surface productivity, desert extent and forest fires. The length of the record depends on the depth of the ice core and varies from a few years up to 800 kyr (800,000 years) for the EPICA core. The time resolution (i.e. the shortest time period which can be accurately distinguished) depends on the amount of annual snowfall, and reduces with depth as the ice compacts under the weight of layers accumulating on top of it. Upper layers of ice in a core correspond to a single year or sometimes a single season. Deeper into the ice the layers thin and annual layers become indistinguishable. An ice core from the right site can be used to reconstruct an uninterrupted and detailed climate record extending over hundreds of thousands of years, providing information on a wide variety of aspects of climate at each point in time. It is the simultaneity of these properties recorded in the ice that makes ice cores such a powerful tool in paleoclimate research. Sampling the surface of Taku Glacier in Alaska. There is increasingly denser firn between surface snow and blue glacier ice. Ice sheets are formed from snow. Because an ice sheet survives summer, the temperature in that location usually does not warm much above freezing. In many locations in Antarctica the air temperature is always well below the freezing point of water. If the summer temperatures do get above freezing, any ice core record will be severely degraded or completely useless, since meltwater will percolate into the snow. The surface layer is snow in various forms, with air gaps between snowflakes. As snow continues to accumulate, the buried snow is compressed and forms firn, a grainy material with a texture similar to granulated sugar. Air gaps remain, and some circulation of air continues. As snow accumulates above, the firn continues to densify, and at some point the pores close off and the air is trapped. Because the air continues to circulate until then, the ice age and the age of the gas enclosed are not the same, and may differ by hundreds of years. The gas age–ice age difference is as great as 7 kyr in glacial ice from Vostok. Under increasing pressure, at some depth the firn is compressed into ice. This depth may range between a few to several tens of meters to typically 100 m for Antarctic cores. Below this level material is frozen in the ice. Ice may appear clear or blue. Layers can be visually distinguished in firn and in ice to significant depths. In a location on the summit of an ice sheet where there is little flow, accumulation tends to move down and away, creating layers with minimal disturbance. In a location where underlying ice is flowing, deeper layers may have increasingly different characteristics and distortion. Drill cores near bedrock often are challenging to analyze due to distorted flow patterns and composition likely to include materials from the underlying surface. GISP2 ice core at 1837 meters depth with clearly visible annual layers. The layer of porous firn on Antarctic ice sheets is 50–150 m deep. It is much less deep on glaciers. Air in the atmosphere and firn are slowly exchanged by molecular diffusion through pore spaces, because gases move toward regions of lower concentration. 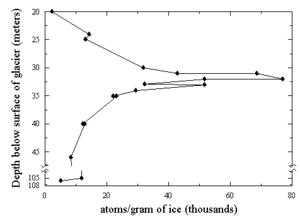 Thermal diffusion causes isotope fractionation in firn when there is rapid temperature variation, creating isotope differences which are captured in bubbles when ice is created at the base of firn. There is gas movement due to diffusion in firn, but not convection except very near the surface. Below the firn is a zone in which seasonal layers alternately have open and closed porosity. These layers are sealed with respect to diffusion. Gas ages increase rapidly with depth in these layers. Various gases are fractionated while bubbles are trapped where firn is converted to ice. A core is collected by separating it from the surrounding material. For material which is sufficiently soft, coring may be done with a hollow tube. Deep core drilling into hard ice, and perhaps underlying bedrock, involves using a hollow drill which actively cuts a cylindrical pathway downward around the core. When a drill is used, the cutting apparatus is on the bottom end of a drill barrel, the tube which surrounds the core as the drill cuts downward around the edge of the cylindrical core. The length of the drill barrel determines the maximum length of a core sample (6 m at GISP2 and Vostok). Collection of a long core record thus requires many cycles of lowering a drill/barrel assembly, cutting a core 4–6 m in length, raising the assembly to the surface, emptying the core barrel, and preparing a drill/barrel for drilling. Because deep ice is under pressure and can deform, for cores deeper than about 300 m the hole will tend to close if there is nothing to supply back pressure. The hole is filled with a fluid to keep the hole from closing. The fluid, or mixture of fluids, must simultaneously satisfy criteria for density, low viscosity, frost resistance, as well as workplace safety and environmental compliance. The fluid must also satisfy other criteria, for example those stemming from the analytical methods employed on the ice core. A number of different fluids and fluid combinations have been tried in the past. Since GISP2 (1990–1993) the US Polar Program has utilized a single-component fluid system, n-butyl acetate, but the toxicology, flammability, aggressive solvent nature, and longterm liabilities of n-butyl acetate raises serious questions about its continued application. The European community, including the Russian program, has concentrated on the use of two-component drilling fluid consisting of low-density hydrocarbon base (brown kerosene was used at Vostok) boosted to the density of ice by addition of halogenated-hydrocarbon densifier. Many of the proven densifier products are now considered too toxic, or are no longer available due to efforts to enforce the Montreal Protocol on ozone-depleting substances. In April 1998 on the Devon Ice Cap filtered lamp oil was used as a drilling fluid. In the Devon core it was observed that below about 150 m the stratigraphy was obscured by microfractures. Modern practice is to ensure that cores remain uncontaminated, since they are analysed for trace quantities of chemicals and isotopes. They are sealed in plastic bags after drilling and analysed in clean rooms. The core is carefully extruded from the barrel; often facilities are designed to accommodate the entire length of the core on a horizontal surface. Drilling fluid will be cleaned off before the core is cut into 1-2 meter sections. Various measurements may be taken during preliminary core processing. Keeping ice well below the freezing point. At Greenland and Antarctic sites, temperature is maintained by having storage and work areas under the snow/ice surface. At GISP2, cores were never allowed to rise above -15 °C, partly to prevent microcracks from forming and allowing present-day air to contaminate the fossil air trapped in the ice fabric, and partly to inhibit recrystallization of the ice structure. Wearing special clean suits over cold weather clothing. Plastic bags, often polyethylene, around ice cores. Some drill barrels include a liner. Proper cleaning of tools and laboratory equipment. Use of laminar-flow bench to isolate core from room particulates. For shipping, cores are packed in Styrofoam boxes protected by shock absorbing bubble-wrap. Due to the many types of analysis done on core samples, sections of the core are scheduled for specific uses. After the core is ready for further analysis, each section is cut as required for tests. Some testing is done on site, other study will be done later, and a significant fraction of each core segment is reserved for archival storage for future needs. Projects have used different core-processing strategies. Some projects have only done studies of physical properties in the field, while others have done significantly more study in the field. These differences are reflected in the core processing facilities. Deep ice is under great pressure. When brought to the surface, there is a drastic change in pressure. Due to the internal pressure and varying composition, particularly bubbles, sometimes cores are very brittle and can break or shatter during handling. At Dome C, the first 1000 m were brittle ice. Siple dome encountered it from 400 to 1000 m. It has been found that allowing ice cores to rest for some time (sometimes for a year) makes them become much less brittle. It has been observed that the internal structure of ice undergoes distinct changes during relaxation. Changes include much more pronounced cloudy bands and much higher density of "white patches" and bubbles. Several techniques have been examined. Cores obtained by hot water drilling at Siple Dome in 1997–1998 underwent appreciably more relaxation than cores obtained with the PICO electro-mechanical drill. In addition, the fact that cores were allowed to remain at the surface at elevated temperature for several days likely promoted the onset of rapid relaxation. Many materials can appear in an ice core. Layers can be measured in several ways to identify changes in composition. Small meteorites may be embedded in the ice. Volcanic eruptions leave identifiable ash layers. Dust in the core can be linked to increased desert area or wind speed. Isotopic analysis of the ice in the core can be linked to temperature and global sea level variations. Analysis of the air contained in bubbles in the ice can reveal the palaeocomposition of the atmosphere, in particular CO2 variations. There are great problems relating the dating of the included bubbles to the dating of the ice, since the bubbles only slowly "close off" after the ice has been deposited. However, with respect to the onset of deglaciations, any porosity (which typically lasts less than 100 years) would facilitate instrusion of rising CO2 levels into older ice, yet research shows CO2 instead lags temperature increases by 600 +/- 400 years. Beryllium-10 concentrations are linked to cosmic ray intensity which can be a proxy for solar strength. There may be an association between atmospheric nitrates in ice and solar activity. However, recently it was discovered that sunlight triggers chemical changes within top levels of firn which significantly alter the pore air composition. This raises levels of formaldehyde and NOx. Although the remaining levels of nitrates may indeed be indicators of solar activity, there is ongoing investigation of resulting and related effects of effects upon ice core data. Some contamination has been detected in ice cores. The levels of lead on the outside of ice cores is much higher than on the inside. In ice from the Vostok core (Antarctica), the outer portion of the cores have up to 3 and 2 orders of magnitude higher bacterial density and dissolved organic carbon than the inner portion of the cores, respectively, as a result of drilling and handling. As porous snow consolidates into ice, the air within it is trapped in bubbles. This process continuously preserves samples of the atmosphere. In order to retrieve these natural samples the ice is ground at low temperatures, allowing the trapped air to escape. It is then condensed for analysis by gas chromatography or mass spectrometry, revealing gas concentrations and their isotopic composition respectively. Apart from the intrinsic importance of knowing relative gas concentrations (e.g. to estimate the extent of greenhouse warming), their isotopic composition can provide information on the sources of gases. For example, CO2 from fossil-fuel or biomass burning is relatively depleted in 13C. See Friedli et al., 1986. Dating the air with respect to the ice it is trapped in is problematic. The consolidation of snow to ice necessary to trap the air takes place at depth (the 'trapping depth') once the pressure of overlying snow is great enough. Since air can freely diffuse from the overlying atmosphere throughout the upper unconsolidated layer (the 'firn'), trapped air is younger than the ice surrounding it. Trapping depth varies with climatic conditions, so the air-ice age difference could vary between 2500 and 6000 years (Barnola et al., 1991). However, air from the overlying atmosphere may not mix uniformly throughout the firn (Battle et al., 1986) as earlier assumed, meaning estimates of the air-ice age difference could be less than imagined. Either way, this age difference is a critical uncertainty in dating ice-core air samples. In addition, gas movement would be different for various gases; for example, larger molecules would be unable to move at a different depth than smaller molecules so the ages of gases at a certain depth may be different. Some gases also have characteristics which affect their inclusion, such as helium not being trapped because it is soluble in ice. In Law Dome ice cores, the trapping depth at DE08 was found to be 72 m where the age of the ice is 40±1 years; at DE08-2 to be 72 m depth and 40 years; and at DSS to be 66 m depth and 68 years. At the South Pole, the firn-ice transition depth is at 122 m, with a CO2 age of about 100 years. Gases involved in ozone depletion, CFCs, chlorocarbons, and bromocarbons, were measured in firn and levels were almost zero at around 1880 except for CH3Br, which is known to have natural sources. 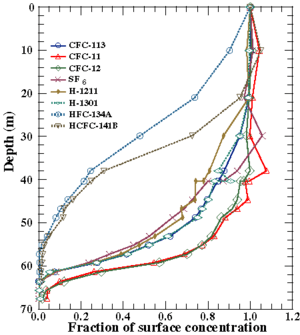 Similar study of Greenland firn found that CFCs vanished at a depth of 69 m (CO2 age of 1929). 36Cl from 1960s nuclear bombs in US glacier ice. Analysis of the Upper Fremont Glacier ice core showed large levels of chlorine-36 that definitely correspond to the production of that isotope during atmospheric testing of nuclear weapons. This result is interesting because the signal exists despite being on a glacier and undergoing the effects of thawing, refreezing, and associated meltwater percolation. 36Cl has also been detected in the Dye-3 ice core (Greenland), and in firn at Vostok. Studies of gases in firn often involve estimates of changes in gases due to physical processes such as diffusion. However, it has been noted that there also are populations of bacteria in surface snow and firn at the South Pole, although this study has been challenged. It had previously been pointed out that anomalies in some trace gases may be explained as due to accumulation of in-situ metabolic trace gas byproducts. 19 cm long section of GISP 2 ice core from 1855 m showing annual layer structure illuminated from below by a fiber optic source. Section contains 11 annual layers with summer layers (arrowed) sandwiched between darker winter layers. Shallow cores, or the upper parts of cores in high-accumulation areas, can be dated exactly by counting individual layers, each representing a year. These layers may be visible, related to the nature of the ice; or they may be chemical, related to differential transport in different seasons; or they may be isotopic, reflecting the annual temperature signal (for example, snow from colder periods has less of the heavier isotopes of H and O). Deeper into the core the layers thin out due to ice flow and high pressure and eventually individual years cannot be distinguished. It may be possible to identify events such as nuclear bomb atmospheric testing's radioisotope layers in the upper levels, and ash layers corresponding to known volcanic eruptions. Volcanic eruptions may be detected by visible ash layers, acidic chemistry, or electrical resistance change. Some composition changes are detected by high-resolution scans of electrical resistance. Lower down the ages are reconstructed by modeling accumulation rate variations and ice flow. Dating is a difficult task. Five different dating methods have been used for Vostok cores, with differences such as 300 years per meter at 100 m depth, 600yr/m at 200 m, 7000yr/m at 400 m, 5000yr/m at 800 m, 6000yr/m at 1600 m, and 5000yr/m at 1934 m.
Ice cores are typically stored and transported in refrigerated ISO container systems. Due to the high value and the temperature-sensitive nature of the ice core samples, container systems with primary and back-up refrigeration units and generator sets are often used. Known as a Redundant Container System in the industry, the refrigeration unit and generator set automatically switches to its back-up in the case of a loss of performance or power to provide the ultimate peace of mind when shipping this valuable cargo. Ice cores have been taken from many locations around the world. Major efforts have taken place on Greenland and Antarctica. Sites on Greenland are more susceptible to snow melt than those in Antarctica. In the Antarctic, areas around the Antarctic Peninsula and seas to the west have been found to be affected by El Niño ENSO effects. Both of these characteristics have been used to study such variations over long spans of time. The first to winter on the inland ice was Johan Peter Koch and Alfred Wegener in a hut they built on the ice in Northeast Greenland. Inside the hut they drilled to a depth of 25 m with an auger similar to an oversized corkscrew. Eismitte means Ice-Center in German. The Greenland campsite was located 402 kilometers (250 mi) from the coast at an estimated altitude of 3,000 meters (9,843 feet). As a member of the Alfred Wegener Expedition to Eismitte in central Greenland from July 1930 to August 1931, Ernst Sorge hand-dug a 15 m deep pit adjacent to his beneath-the-surface snow cave. Sorge was the first to systematically and quantitatively study the near-surface snow/firn strata from inside his pit. His research validated the feasibility of measuring the preserved annual snow accumulation cycles, like measuring frozen precipitation in a rain gauge. During 1950-1951 members of Expeditions Polaires Francaises (EPF) led by Paul-Émile Victor reported boring two holes to depths of 126 and 150 m on the central Greenland inland ice at Camp VI and Station Central (Centrale). Camp VI is in the western part of Greenland on the EPF-EGIG line at an elevation of 1598 masl. The Station Centrale was not far from station Eismitte. Centrale is on a line between Milcent (70°18’N 45°35’W, 2410 masl) and Crête (71°7’N 37°19’W), at about (70°43'N 41°26'W), whereas Eismitte is at (71°10’N 39°56’W, ~3000 masl). In 1956, pre-International Geophysical Year (IGY) of 1957-58, a 10 cm diameter core using a rotary mechanical drill (US) to 305 m was recovered. A second 10 cm diameter core was recovered in 1957 by the same drill rig to 411 m. A commercially modified, mechanical-rotary Failing-1500 rock-coring rig was used, fitted with special ice cutting bits. Three cores were attempted at Camp Century in 1961, 1962, and again in 1963. The third hole was started in 1963 and reached 264 m. The 1963 hole was re-entered using the thermal drill (US) in 1964 and extended to 535 m. In mid-1965 the thermal drill was replaced with an electro-mechanical drill, 9.1 cm diameter, that reached the base of the ice sheet in July 1966 at 1387 m. The Camp Century, Greenland, (77°10’N 61°08’W, 1885 masl) ice core (cored from 1963–1966) is 1390 m deep and contains climatic oscillations with periods of 120, 940, and 13,000 years. Another core in 1977 was drilled at Camp Century using a Shallow (Dane) drill type, 7.6 cm diameter, to 100 m.
At the North Site (75°46’N 42°27’W, 2870 masl) drilling began in 1972 using a SIPRE (US) drill type, 7.6 cm diameter to 25 m. The North Site was 500 km north of the EGIG line. At a depth of 6–7 m diffusion had obliterated some of the seasonal cycles. The first core at North Central (74°37’N 39°36’W) was drilled in 1972 using a Shallow (Dane) drill type, 7.6 cm diameter to 100 m.
At Crête in central Greenland (71°7’N 37°19’W) drilling began in 1972 on the first core using a SIPRE (US) drill type, 7.6 cm diameter to 15 m.
The Crête core was drilled in central Greenland (1974) and reached a depth of 404.64 meters, extending back only about fifteen centuries. Annual cycle counting showed that the oldest layer was deposited in 534 AD. The Crête 1984 ice cores consist of 8 short cores drilled in the 1984-85 field season as part of the post-GISP campaigns. Glaciological investigations were carried out in the field at eight core sites (A-H). "The first core drilled at Station Milcent in central Greenland covers the past 780 years." Milcent core was drilled at 70.3°N, 44.6°W, 2410 masl. The Milcent core (398 m) was 12.4 cm in diameter, using a Thermal (US) drill type, in 1973. Drilling with a Shallow (Swiss) drill type at Dye 2 (66°23’N 46°11’W, 2338 masl) began in 1973. The core was 7.6 cm in diameter to a depth of 50 m. A second core to 101 m was 10.2 cm in diameter was drilled in 1974. An additional core at Dye 2 was drilled in 1977 using a Shallow (US) drill type, 7.6 cm diameter, to 84 m.
The camp is located approximately 360 km from the east coast and 500 km from the west coast of Greenland at (Saattut, Uummannaq), and 200 km NNE of the historical ice sheet camp Eismitte. The closest town is Ittoqqortoormiit, 460 km ESE of the station. The station however is not part of Sermersooq municipality, but falls within the bounds of the Northeast Greenland National Park. An initial core at Summit (71°17’N 37°56’W, 3212 masl) using a Shallow (Swiss) drill type was 7.6 cm in diameter for 31 m in 1974. Summit Camp, also Summit Station, is a year-round research station on the apex of the Greenland Ice Sheet. Its coordinates are variable, since the ice is moving. The coordinates provided here (72°34’45"N 38°27’26"W, 3212 masl) are as of 2006. The first core at South Dome (63°33’N 44°36’W, 2850 masl) used a Shallow (Swiss) drill type for a 7.6 cm diameter core to 80 m in 1975. The first GISP core drilled at Hans Tausen Iskappe (82°30’N 38°20’W, 1270 masl) was in 1975 using a Shallow (Swiss) drill type, 7.6 cm diameter core to 60 m. The second core at Hans Tausen was drilled in 1976 using a Shallow (Dane) drill type, 7.6 cm diameter to 50 m. The drilling team reported that the drill was stuck in the drill hole and lost. The Hans Tausen ice cap in Peary Land was drilled again with a new deep drill to 325 m. The ice core contained distinct melt layers all the way to bedrock indicating that Hans Tausen contains no ice from the glaciation; i.e., the world's northernmost ice cap melted away during the post-glacial climatic optimum and was rebuilt when the climate got colder some 4000 years ago. The first core at Camp III (69°43’N 50°8’W) was drilled in 1977 using a Shallow (Swiss) drill type, 7.6 cm, to 49 m. The last core at Camp III was drilled in 1978 using a Shallow (Swiss) drill type, 7.6 cm diameter, 80 m depth. The Greenland Ice Sheet Project (GISP) including Dye 3 was a decade-long project to drill 20 ice cores in Greenland. The Renland ice core from East Greenland apparently covers a full glacial cycle from the Holocene into the previous Eemian interglacial. It was drilled in 1985 to a length of 325 m. From the delta-profile, the Renland ice cap in the Scoresbysund Fiord has always been separated from the inland ice, yet all the delta-leaps revealed in the Camp Century 1963 core recurred in the Renland ice core. The GRIP and GISP cores, each about 3000 m long, were drilled by European and US teams respectively on the summit of Greenland. Their usable record stretches back more than 100,000 years into the last interglacial. They agree (in the climatic history recovered) to a few metres above bedrock. However, the lowest portion of these cores cannot be interpreted, probably due to disturbed flow close to the bedrock. There is evidence the GISP2 cores contain an increasing structural disturbance which casts suspicion on features lasting centuries or more in the bottom 10% of the ice sheet. The more recent NorthGRIP ice core provides an undisturbed record to approx. 123,000 years before present. The results indicate that Holocene climate has been remarkably stable and have confirmed the occurrence of rapid climatic variation during the last ice age. The NGRIP drilling site is near the center of Greenland (75°06′N 42°19′W﻿ / ﻿75.1°N 42.32°W﻿ / 75.1; -42.32﻿ (NGRIP drilling site), 2917 m, ice thickness 3085). Drilling began in 1999 and was completed at bedrock in 2003. The NGRIP site was chosen to extract a long and undisturbed record stretching into the last glacial. NGRIP covers 5 kyr of the Eemian, and shows that temperatures then were roughly as stable as the pre-industrial Holocene temperatures were. The North Greenland Eemian Ice Drilling (NEEM) site is located at 77°27’N 51°3.6’W, masl. Drilling started in June 2009. The ice at NEEM was expected to be 2545 m thick. On July 26, 2010, drilling reached bedrock at 2537.36 m.
Aurora Basin North is 550 km inland of Australia's Casey station. In 2013-14, an team of international scientists led by the Australian Antarctic Program extracted a 303m-long ice core (providing annual climate records for the past 2000 years) and two shallow ice cores (spanning the past 800 to 1000 years). Marie Byrd Land formerly hosted the Operation Deep Freeze base Byrd Station (NBY), beginning in 1957, in the hinterland of Bakutis Coast. Byrd Station was the only major base in the interior of West Antarctica. In 1968, the first ice core to fully penetrate the Antarctic Ice Sheet was drilled here. The Byrd 1968 core was 2164 m to bedrock and exhibited the post-glacial climatic optimum correlateably well with the Camp Century 1963 core from Greenland. The British Antarctic Survey (BAS) has used Dolleman Island as ice core drilling site in 1976, 1986 and 1993. In the 1994/1995 field season the British Antarctic Survey, Alfred Wegener Institute and the Forschungsstelle für Physikalische Glaziologie of the University of Münster cooperated in a project drilling ice cores on the North and South Domes of Berkner Island. Between 1997 and 1999 the international Cape Roberts Project (CRP) has recovered up to 1000 m long drill cores in the Ross Sea, Antarctica to reconstruct the glaciation history of Antarctica. The International Trans-Antarctic Scientific Expedition (ITASE) was created in 1990 with the purpose of studying climate change through research conducted in Antarctica. A 1990 meeting held in Grenoble, France, served as a site of discussion regarding efforts to study the surface and subsurface record of Antarctica's ice cores. The lake gained widespread recognition in December 2002 when a research team, led by the University of Illinois at Chicago's Peter Doran, announced the discovery of 2,800‑year‑old halophile microbes (primarily filamentous cyanobacteria) preserved in ice layer core samples drilled in 1996. Law Dome is located about 120 km from Australia's Casey Station near the edge of the East Antarctic ice sheet and rises 1400m above sea level. The drilling operation, led by researchers with the Australian Antarctic Program, recovered a 1200m-long surface-to-bedrock ice core from near the Dome's summit. The climate record contained in the core extends back 90,000 years. Due to its location close to the coastline, Law Dome is exposed to the major storm systems from the Southern Ocean, delivering very high snowfall for a polar location and preserving fine detail. The coastal location also provides records that have strong connections to lower-latitude climate processes such as the El Niño Southern Oscillation (ENSO) and the Interdecadal Pacific Oscillation (IPO). Plateau Station is an inactive American research and Queen Maud Land traverse support base on the central Antarctic Plateau. The base was in continuous use until January 29, 1969. Ice core samples were made, but with mixed success. The Siple Dome ice core project (79.468° S 112.086° W) was conducted by the United States National Science Foundation. The bottom most ice was recovered in 1999 from 974 m with an age of 97,600 years. It is best known for the poorly explained steps in water isotopes during the deglacial which are unique to this core and a record of atmospheric carbon dioxide. The Chief Scientist was Kendrick C. Taylor Jr. A documentary on the Siple Dome ice core project was produced by NOVA (Warnings from the Ice, 1998). As of 2003, the longest core drilled was at Vostok station. It reached back 420,000 years and revealed 4 past glacial cycles. Drilling stopped just above Lake Vostok. The Vostok core was not drilled at a summit, hence ice from deeper down has flowed from upslope; this slightly complicates dating and interpretation. Vostok core data are available. The European Project for Ice Coring in Antarctica (EPICA) first drilled a core near Dome C at 75°S 123°E﻿ / ﻿75°S 123°E﻿ / -75; 123﻿ (EPICA core) (560 km from Vostok) at an altitude of 3,233 m. The ice thickness is 3,309 ± 22 m and the core was drilled to 3,190 m. It is the longest ice core on record, where ice has been sampled to an age of 800 kyr BP (Before Present). Present-day annual average air temperature is -54.5 °C and snow accumulation 25 mm/y. Information about the core was first published in Nature on June 10, 2004. The core revealed 8 previous glacial cycles. They subsequently drilled a core at Kohnen Station in 2006. Although the major events recorded in the Vostok, EPICA, NGRIP, and GRIP during the last glacial period are present in all four cores, some variation with depth (both shallower and deeper) occurs between the Antarctic and Greenland cores. Two deep ice cores were drilled near the Dome F summit (77°19′S 39°42′E﻿ / ﻿77.317°S 39.700°E﻿ / -77.317; 39.700﻿ (Dome F), altitude 3,810 m). The first drilling started in August 1995, reached a depth of 2503 m in December 1996 and covers a period back to 320,000 years. The second drilling started in 2003, was carried out during four subsequent austral summers from 2003/2004 until 2006/2007, and by then a depth of 3,035.22 m was reached. This core greatly extends the climatic record of the first core, and, according to a first, preliminary dating, it reaches back until 720,000 years. The WAIS Divide ice core project (79.468° S 112.086° W) was conducted by the United States National Science Foundation. The bottom most ice was recovered in 2011 from 3,405 m with an age of 67,748 years. The project is best known for producing records of atmospheric carbon dioxide and methane with high time resolution and dating accuracy,. The Chief Scientist was Kendrick C. Taylor Jr.
TAlos Dome Ice CorE Project is a new 1620 m deep ice core drilled at Talos Dome that provides a paleoclimate record covering at least the last 250,000 years. The TALDICE coring site (159°11'E 72°49'S; 2315 m a.s.l. ; annual mean temperature -41 °C) is located near the dome summit and is characterised by an annual snow accumulation rate of 80 mm water equivalent. The non-polar ice caps, such as found on mountain tops, were traditionally ignored as serious places to drill ice cores because it was generally believed the ice would not be more than a few thousand years old, however since the 1970s ice has been found that is older, with clear chronological dating and climate signals going as far back as the beginning of the most recent ice age . Although polar cores have the clearest and longest chronological record, four-times or more as long, ice cores from tropical regions offer data and insights not available from polar cores and have been very influential in advancing understanding of the planets climate history and mechanisms. Mountain ice cores have been retrieved in the Andes in South America, Mount Kilimanjaro in Africa, Tibet, various locations in the Himalayas, Alaska, Russia and elsewhere. Mountain ice cores are logistically very difficult to obtain. The drilling equipment must be carried by hand, organized as a mountaineering expedition with multiple stage camps, to altitudes upwards of 20,000 feet (helicopters are not safe), and the multi-ton ice cores must then be transported back down the mountain, all requiring mountaineering skills and equipment and logistics and working at low oxygen in extreme environments in remote third world countries. Scientists may stay at high altitude on the ice caps for up 20 to 50 days setting altitude endurance records that even professional climbers do not obtain. American scientist Lonnie Thompson has been pioneering this area since the 1970s, developing light-weight drilling equipment that can be carried by porters, solar-powered electricity, and a team of mountaineering-scientists. The ice core drilled in Guliya ice cap in western China in the 1990s reaches back to 760,000 years before the present — farther back than any other core at the time, though the EPICA core in Antarctica equalled that extreme in 2003. More recent studies have suggested a longer time span for the Guliya ice cap. Because glaciers are retreating rapidly worldwide, some important glaciers are now no longer scientifically viable for taking cores, and many more glacier sites will continue to be lost, the "Snows of Mount Kilimanjaro" (Hemingway) for example could be gone by 2015. Ice cores from Sajama in Bolivia span ~25 ka and help present a high resolution temporal picture of the Late Glacial Stage and the Holocene climatic optimum. Ice cores from Huascarán in Peru like those from Sajama span ~25 ka and help present a high resolution temporal picture of the Late Glacial Stage and the Holocene climatic optimum. Although the ice cores from Quelccaya ice cap only go back ~2 ka, others may go back ~5.2 ka. The Quelccaya ice cores correlate with those from the Upper Fremont Glacier. Evidence for three periods of abrupt climate change in the Holocene climatic optimum have been recovered from six Kilimanjaro ice cores drilled in January and February 2000. These cores provide a ~11.7 ka record of Holocene climate and environmental variability including three periods of abrupt climate change at ~8.3, ~5.2 and ~4 ka. 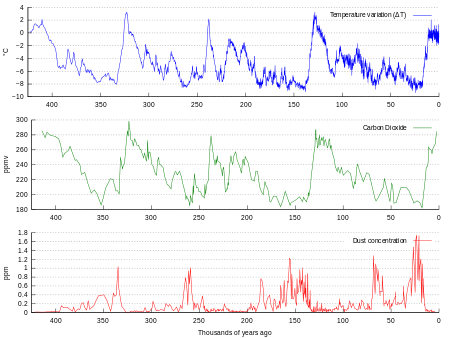 These three periods correlate with similar events in the Greenland GRIP and GISP2 cores. A shallow ice core drilled from the East Rongbuk glacier showed a dramatic increasing trend of black carbon concentrations in the ice stratigraphy since the 1990s. Core sample in general from ocean floor, rocks and ice. WAIS Divide Ice Core Drilling Project. ^ Bender, M.; Sowers, T.; Brook, E. (1997). "Gases in ice cores". Proceedings of the National Academy of Sciences. 94 (16): 8343–9. Bibcode:1997PNAS...94.8343B. doi:10.1073/pnas.94.16.8343. JSTOR 42859. PMC 33751 . PMID 11607743. ^ Kaspers, Karsten Adriaan. "Chemical and physical analyses of firn and firn air: from Dronning Maud Land, Antarctica; 2004-10-04". DAREnet. Retrieved October 14, 2005. ^ "The Composition of Air in the Firn of Ice Sheets and the Reconstruction of Anthropogenic Changes in Atmospheric Chemistry". Retrieved October 14, 2005. ^ Gow, A. J.; Meese, D. A.; Alley, R. B.; Fitzpatrick, J. J.; Anandakrishnan, S.; Woods, G. A.; Elder, B. C. (1997). "Physical and structural properties of the Greenland Ice Sheet Project 2 ice core: A review". Journal of Geophysical Research. 102: 26559. Bibcode:1997JGR...10226559G. doi:10.1029/97JC00165. ^ "Physical Properties Research on the GISP2 Ice Core". Retrieved October 14, 2005. ^ Svensson, Anders; Nielsen, Søren Wedel; Kipfstuhl, Sepp; Johnsen, Sigfus J.; Steffensen, Jørgen Peder; Bigler, Matthias; Ruth, Urs; Röthlisberger, Regine (2005). "Visual stratigraphy of the North Greenland Ice Core Project (NorthGRIP) ice core during the last glacial period". Journal of Geophysical Research. 110: 2108. Bibcode:2005JGRD..110.2108S. doi:10.1029/2004JD005134. ^ A.J. Gow; D.A. Meese. "The Physical and Structural Properties of the Siple Dome Ice Cores". WAISCORES. Retrieved October 14, 2005. ^ "Purdue study rethinks atmospheric chemistry from ground up". Archived from the original on December 28, 2005. Retrieved October 14, 2005. ^ "Summit_ACS.html". Retrieved October 14, 2005. ^ Ng, Amy; Patterson, Clair (1981). "Natural concentrations of lead in ancient Arctic and Antarctic ice". Geochimica et Cosmochimica Acta. 45 (11): 2109–21. Bibcode:1981GeCoA..45.2109N. doi:10.1016/0016-7037(81)90064-8. ^ "Glacial ice cores: a model system for developing extraterrestrial decontamination protocols". Publications of Brent Christner. Archived from the original on March 7, 2005. Retrieved May 23, 2005. ^ Bender, Michael; Sowers, Todd; Brook, Edward (1997). "Gases in ice cores". Proceedings of the National Academy of Sciences. 94 (16): 8343–9. Bibcode:1997PNAS...94.8343B. doi:10.1073/pnas.94.16.8343. JSTOR 42859. PMC 33751 . PMID 11607743. ^ "TRENDS: ATMOSPHERIC CARBON DIOXIDE". Retrieved October 14, 2005. ^ "CMDL Annual Report 23: 5.6. MEASUREMENT OF AIR FROM SOUTH POLE FIRN". Retrieved October 14, 2005. ^ "Climate Prediction Center — Expert Assessments". Retrieved October 14, 2005. ^ M.M. Reddy; D.L. Naftz; P.F. Schuster. "FUTURE WORK". ICE-CORE EVIDENCE OF RAPID CLIMATE SHIFT DURING THE TERMINATION OF THE LITTLE ICE AGE. Archived from the original on September 13, 2005. Retrieved October 14, 2005. ^ "Thermonuclear 36Cl". Archived from the original on May 23, 2005. Retrieved October 14, 2005. ^ Delmas RJ; J Beer; HA Synal; et al. (2004). "Bomb-test 36Cl measurements in Vostok snow (Antarctica) and the use of 36Cl as a dating tool for deep ice cores". Tellus B. 36 (5): 492. Bibcode:2004TellB..56..492D. doi:10.1111/j.1600-0889.2004.00109.x. ^ Carpenter EJ, Lin S, Capone DG (October 2000). "Bacterial Activity in South Pole Snow". Appl. Environ. Microbiol. 66 (10): 4514–7. doi:10.1128/AEM.66.10.4514-4517.2000. PMC 92333 . PMID 11010907. ^ Warren SG, Hudson SR (October 2003). "Bacterial Activity in South Pole Snow Is Questionable". Appl. Environ. Microbiol. 69 (10): 6340–1; author reply 6341. doi:10.1128/AEM.69.10.6340-6341.2003. PMC 201231 . PMID 14532104. ^ Sowers, T. (2003). "Evidence for in-situ metabolic activity in ice sheets based on anomalous trace gas records from the Vostok and other ice cores". EGS - AGU - EUG Joint Assembly: 1994. Bibcode:2003EAEJA.....1994S. ^ "NOAA Paleoclimatology Program — Vostok Ice Core Timescales". Retrieved October 14, 2005. ^ "Polar Paleo-Climate Interests". Retrieved October 14, 2005. ^ Jim White; Eric Steig. "Siple Dome Highlights: Stable isotopes". WAISCORES. Retrieved October 14, 2005. ^ "GISP2 and GRIP Records Prior to 110 kyr BP". Archived from the original on September 9, 2005. Retrieved October 14, 2005. ^ Whitehouse, David (14 October 2005). "Breaking through Greenland's ice cap". BBC. 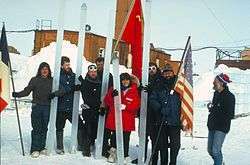 ^ "NOAA Paleoclimatology Program — Vostok Ice Core". Retrieved October 14, 2005. ↑ Schwander, J.; Stauffer, B.; Sigg, A. (October 1988). "AIR MIXING IN FIRN AND THE AGE OF THE AIR AT PORE CLOSE- OFF" (PDF). www.igsoc.org. International Glaciological Society. Retrieved 29 June 2016. ↑ Fischer, H.; Wahlen, Martin; Smith, Jesse; Mastroianni, Derek; Deck, Bruce (1999). 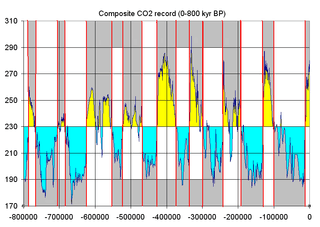 "Ice Core Records of Atmospheric CO2 Around the Last Three Glacial Terminations". Science. 283 (5408): 1712–4. Bibcode:1999Sci...283.1712F. doi:10.1126/science.283.5408.1712. PMID 10073931. 1 2 3 4 5 6 7 8 9 Dansgaard W. Frozen Annals Greenland Ice Sheet Research. Odder, Denmark: Narayana Press. p. 124. ISBN 87-990078-0-0. 1 2 3 Langway CC Jr. (Jan 2008). "The History of Early Polar Ice Cores" (PDF). Cold Regions Science and Technology. 52 (2): 101. doi:10.1016/j.coldregions.2008.01.001. ↑ Wegener, Kurt (1955). 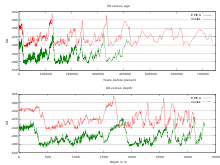 "Die Temperatur in Grönlandischen Inlandeis" [The temperature in the Greenland ice sheet]. Geofisica Pura e Applicata (in German). 32: 102–6. Bibcode:1955GeoPA..32..102W. doi:10.1007/BF01993599. ↑ Rose LE. "The Greenland Ice Cores". Kronos. 12 (1 (Winter)): 55–68. 1 2 Oeschger, H.; Beer, J.; Andree, M.; Fehn, U.; Damon, P.; Raisbeck, G.; Henning, W.; Bard, E. (1987). "Formula Be and FormulaC in the Earth System [and Discussion]". Philosophical Transactions of the Royal Society A: Mathematical, Physical and Engineering Sciences. 323 (1569): 45. Bibcode:1987RSPTA.323...45O. doi:10.1098/rsta.1987.0071. ↑ "NOAA Paleoclimatology World Data Centers Dye 3 Ice Core". ↑ Hansson, Margareta; Holmén, Kim (2001). "High latitude biospheric activity during the Last Glacial Cycle revealed by ammonium variations in Greenland Ice Cores". Geophysical Research Letters. 28 (22): 4239. Bibcode:2001GeoRL..28.4239H. doi:10.1029/2000GL012317. ↑ "Deep ice tells long climate story". BBC News. September 4, 2006. Retrieved May 4, 2010. ↑ Peplow, Mark (2006). "Ice core shows its age". News@nature. doi:10.1038/news060123-3. ↑ Qiu, Jane (2016). "Tibet's primeval ice". Science. 351 (6272): 436–439. doi:10.1126/science.351.6272.436. ↑ "Deciphering the ice". CNN. 12 September 2001. Archived from the original on 13 June 2008. Retrieved 8 July 2010. 1 2 3 Thompson, Lonnie G.; Mosley-Thompson, Ellen; Henderson, Keith A. (2000). "Ice-core palaeoclimate records in tropical South America since the Last Glacial Maximum". Journal of Quaternary Science. 15 (4): 377. Bibcode:2000JQS....15..377T. doi:10.1002/1099-1417(200005)15:4<377::AID-JQS542>3.0.CO;2-L.
1 2 3 Thompson, L. G.; Mosley-Thompson, Ellen; Davis, Mary E.; Henderson, Keith A.; Brecher, Henry H.; Zagorodnov, Victor S.; Mashiotta, Tracy A.; Lin, Ping-Nan; Mikhalenko, Vladimir N.; Hardy, Douglas R.; Beer, Jürg (2002). "Kilimanjaro Ice Core Records: Evidence of Holocene Climate Change in Tropical Africa". Science. 298 (5593): 589–93. Bibcode:2002Sci...298..589T. doi:10.1126/science.1073198. PMID 12386332. ↑ Ming, J.; Cachier, H.; Xiao, C.; Qin, D.; Kang, S.; Hou, S.; Xu, J. (2008). "Black carbon record based on a shallow Himalayan ice core and its climatic implications". Atmospheric Chemistry and Physics. 8 (5): 1343. doi:10.5194/acp-8-1343-2008. Battle M, Bender M, Sowers T, et al. (1996). "Atmospheric gas concentrations over the past century measured in air from firn at the South Pole". Nature. 383 (6597): 231–5. Bibcode:1996Natur.383..231B. doi:10.1038/383231a0. Friedli H, Lotscher H, Oeschger H, et al. (1986). "Ice core record of the C13/C12 ratio of atmospheric CO2 in the past two centuries". Nature. 324 (6094): 237–8. Bibcode:1986Natur.324..237F. doi:10.1038/324237a0. Andersen, K. K.; Azuma, N.; Barnola, J.-M.; Bigler, M.; Biscaye, P.; Caillon, N.; Chappellaz, J.; Clausen, H. B.; Dahl-Jensen, D.; Fischer, H.; Flückiger, J.; Fritzsche, D.; Fujii, Y.; Goto-Azuma, K.; Grønvold, K.; Gundestrup, N. S.; Hansson, M.; Huber, C.; Hvidberg, C. S.; Johnsen, S. J.; Jonsell, U.; Jouzel, J.; Kipfstuhl, S.; Landais, A.; Leuenberger, M.; Lorrain, R.; Masson-Delmotte, V.; Miller, H.; Motoyama, H.; Narita, H. (2004). "High-resolution record of Northern Hemisphere climate extending into the last interglacial period". Nature. 431 (7005): 147–51. Bibcode:2004Natur.431..147A. doi:10.1038/nature02805. PMID 15356621. 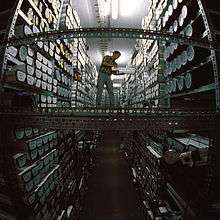 National Ice Core Laboratory - Facility for storing, curating, and studying ice cores recovered from the polar regions. Alley RB (February 2000). "Ice-core evidence of abrupt climate changes". Proc. Natl. Acad. Sci. U.S.A. 97 (4): 1331–4. Bibcode:2000PNAS...97.1331A. doi:10.1073/pnas.97.4.1331. PMC 34297 . PMID 10677460.